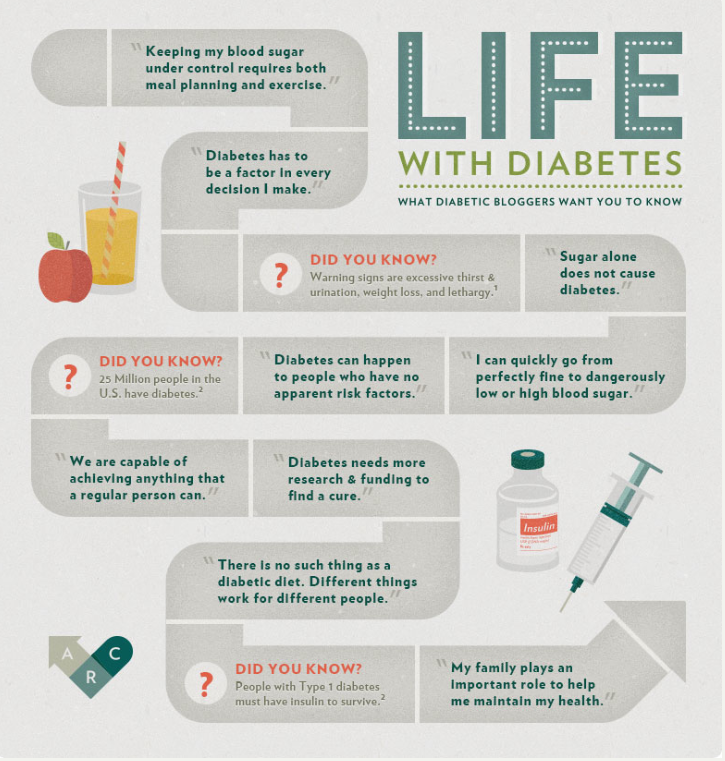 This poster was created last year by the American Recall Center with the help of several diabetes bloggers to help educate people about diabetes. I just found it and thought it worth updating you on several things it says here and explaining a little further. So starting at the top of the maze and going down, “Keeping my blood sugar under control requires both meal planning and exercise.” True. It also requires knowing stress often raises blood sugar as well as being sick. “Diabetes has to be a factor in every decision I make.” Well, most decisions, and I do spend an exceptional amount of time thinking about it. Except maybe when I’m deciding what color bedspread to buy. DID YOU KNOW? “Warning signs are excessive thirst & urination, weight loss and lethargy.” Another key sign of diabetes is often blurry vision. “Sugar alone does not cause diabetes.” Actually sugar does not cause diabetes, period. Best we know, type 2 diabetes is caused by genetics, being sedentary and overweight. Of course if you eat too many foods with sugar, it’s easy to gain weight. The jury is still out on what causes type 1 diabetes. “I can quickly go from perfectly fine to dangerously low or high blood sugar.” Yes, one’s blood sugar fluctuates all day – and all night. But “quickly” is debatable. It may not take hours, but it also doesn’t take seconds. “Diabetes can happen to people who have no apparent risk factors.” Likely the risk factor that’s not apparent is genetics. And, few people know, but 1 in 5 people with type 2 diabetes are slim or normal weight. DID YOU KNOW? “25 million people in the US have diabetes?” Unfortunately, that’s gone up to 29 million people and currently 86 million people have pre-diabetes (or Stage 1 of Type 2 diabetes.) That’s gone up from 79 million. And, one-fourth of people in both populations don’t know they have diabetes. “We are capable of achieving anything that a regular person can.” Well, yes and no. Like everyone with diabetes, I want people to know it doesn’t define or limit me, but it does at times influence what I can do. If I’m having a low, you would not want me to do your taxes. And, hmmm…I think you still can’t be a commercial airline pilot. “Diabetes needs more research & funding to find a cure.” Absolutely. “There is no such thing as a diabetes diet. Different things work for different people.” True, there is no such thing as a diabetes diet. Not like 42 years ago when they handed me one and told me I could no longer eat candy bars. The diet recommended today for all Americans is also recommended for people with diabetes: lots of vegetables, some fruit, whole grains, low fat dairy, lean meat, healthy fats, occasional sweets. Personally, it’s easiest to keep my blood sugar relatively stable when I eat low-carb, which I do. DID YOU KNOW? “People with Type 1 diabetes must have insulin to survive.” Absolutely. I’d also add having a loving spouse, furry pet and work or hobby you love is pretty important too. “My family plays an important role to help me maintain my health.” Hmmm…seems to speak to my point above. However, if you don’t have family or that family, do it for yourself.